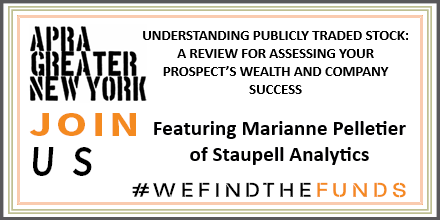 Join Apra GNY and Marianne Pelletier for a three hour, in-depth, hands-on workshop showing you how to analyze your prospect’s stock holdings like an investor. Learn how to assess the relative success of an industry, how to read balance sheets, income statements, and statements of cash flow, and how to use key business ratios to assess your prospect’s company. Hands-in exercises and real life stock examples will be provided, along with a workbook that you can take back to your office as a reference. Ms. Pelletier’s career also includes running an annual giving program with average increased revenues of 27% per year and providing software consulting through the Datatel Corporation, teaching clients both how to use their new software and assisting them with better analysis and more efficient processing. She occasionally serves as a best practices consultant through CampusWorks. A recipient of a lifetime achievement award from the New England Development Research Association and recognized as a Woman of the Year by the National Association of Professional Women, Ms. Pelletier has served as a volunteer for both election campaigns and social service agencies. She has also served on the boards of the New England Development Research Association, the Upstate New York chapter of Apra, and as secretary for the Apra International board. She currently serves as a trustee for Habitat for Humanity of Tompkins County and the Finger Lakes chapter of AFP. Ms. Pelletier is a graduate of Rockford University, and earned her MBA at Southern New Hampshire University. Her recent workbook, Building Your Analytics Shop: A Workbook for Nonprofits, was a finalist for the Terry McAdam Award in 2016.